Choreographers Heather Britt & Jimmy Cunningham with Dancers of the Cincinnati Ballet. In collaboration with the Cincinnati Art Museum, artist Sandra Gross and festival musicians. 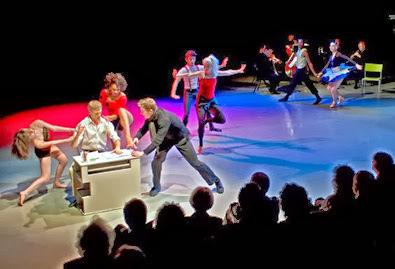 An innovative production featuring ballet dancers, musicians and art installation on the same stage. Heather Britt and James Cunningham, Cincinnati’s exciting rising star choreographers will each present a world premiere work. Set to the music of Stravinsky and musical improvisations, this project features Cincinnati Cincinnati Ballet dancers, art installation by glass artist Sandra Gross and musicians Tatiana Berman, Eddie Kwon and Elena Kholodova. It was a magnificent performance. Add to that, it was a world premiere. Berman is not only an internationally recognized violinist, but founder and hands-on artistic director of Constella, making her achievement that much more remarkable. Coleman’s work shared the program with music by Stravinsky and Mozart (good company). The Constella Festival Chamber Ensemble, a 29-piece orchestra hand-picked by Berman from area musicians, was led by Paavo Järvi, music director laureate of the Cincinnati Symphony Orchestra.